When I woke up very early in the morning, as I usually do, I went out into the living room to see the glorious lights glowing one last time. And Mary and Joseph, the manger, the baby Jesus, the wise men spreading out their humble court one last time on the top of the entertainment center (note: that is not an HDTV; that's a flat screen dinosaur from the "aughts" [i.e. 2000s]...true poverty, American style). I looked wistfully at the ornaments. Some go back to my own childhood and even before. Some are quite fancy, but my favorites are the one with the bride and groom that says "First Christmas, 1996" and the various home made ornaments given to us as gifts by the children when they were very small. I noticed that the star that I made for the top years ago was leaning to one side. It was beginning to fall apart at last. Even durable tape has its limits. 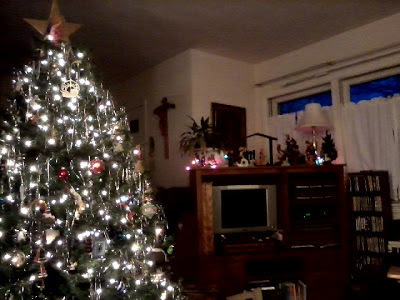 Ah, but the wonders of an artificial tree! It doesn't shed, it doesn't need water, it doesn't die. You can keep it up through January, and then disassemble it and put it in a box and store it away until next year. The human race has lost the tree of paradise, and the trees of this earth must die. The best we can accomplish with all of our arts is an imitation, a plastic copy that does not die because it was never alive. Yeah yeah, sure. But it works. Its hypoallergenic. It looks good. Its fireproof. What the heck, we use electric lights on it anyway. Stop being such a philosophical grump, JJ. Its our Christmas tree. We love it. Its good to let things last. Christmas is not just a big-bash-and-then-its-over. The light has come into the world. The light shines in the darkness. And He is, as Simeon reminds us again on Candlemas day, "the light of revelation to the Gentiles, and the glory of your people Israel" (Luke 2:32). Now, everything is boxed up and put away. Our house is ready for Lent, which begins in less than two weeks. But the desert is not gloomy, because Jesus is there. "The light shines in the darkness, and the darkness has not overcome it" (John 1:5).